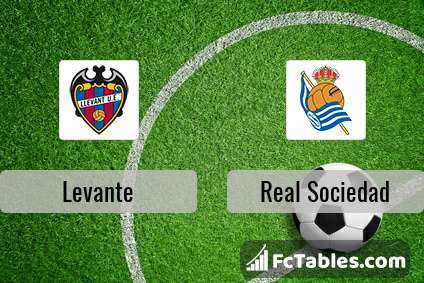 Kick off Levante-Real Sociedad in La Liga on today 20:00. Referee in the match will be David Medie. Team Levante is located in the middle of the table. (7 place). Levante in 5 last matches (league + cup) have collected13 points. 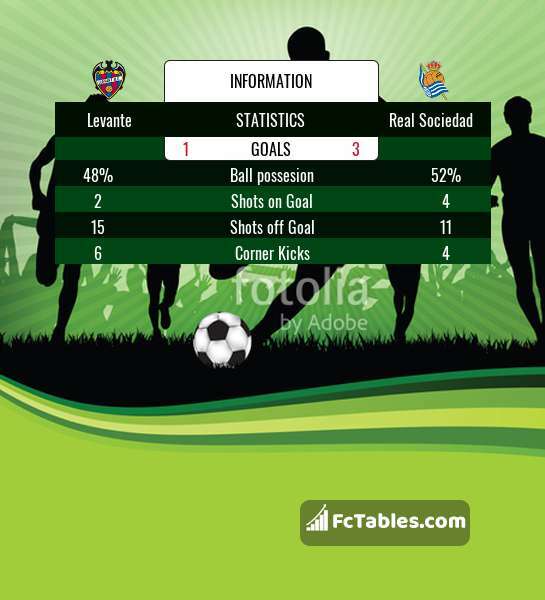 Levante has not been defeated from 5 matches. The most goals in La Liga for Levante scored: Roger 6 goals, Jose Luis Morales 4 goals, Enis Bardi 1 goals. Most goals developed: , Jose Luis Morales 1 assists, Enis Bardi 1 assists. In Levante not occur in the match due to injury: Armando Sadiku, Nikola Vukcevic. Team Real Sociedad is located in the middle of the table. (13 place). In 5 last matches (league + cup) team gain 5 points. Real Sociedad from 3 matches can not beat any rival. Players Real Sociedad in La Liga with the highest number of goals: Willian Jose 3 goals, Mikel Oiarzabal 2 goals, Luca Sangalli 1 goals. Most assists in the club have: , Luca Sangalli 1 assists. Injuries in the team Real Sociedad: David Concha, Joseba Zaldua, Mikel Merino, Martin Merquelanz, Luca Sangalli. Direct matches: Levante won more direct matches. Levante won 8 matches , Real Sociedad won 6 direct matches, was a 8 draws. In 10 matches the sum of the goals both teams was greater than 2.5 (Over 2.5), and 18 matches teams scored more than 1.5 goals (Over 1.5). In 12 matches the both teams scored a least one goal (Both teams to score).